No Frigate Like a Book: Why "When the Elephants Dance" and "Noli Me Tangere"
Why "When the Elephants Dance" and "Noli Me Tangere"
I've lived in a great many places in the United States that have a strong Filipino presence--Hawai'i, California, an American naval base in Japan. Speaking of the U.S. Navy, Filipino nationals serve in great numbers in the fleet, particularly in the Pacific--I'm not quite sure that the Navy could function without them. Despite all that--do you know how many novels that I have read that are set in the Philippines? I mean, the ones that don't just use the islands as part of the background, or a brief stopping place during WWII? One. That's right. One. William Boyd's "The Blue Afternoon", which is set in 1902, immediately after the Filipino attempt to rid the country of the American forces that had gained control of the islands after defeating the Spanish in 1898. States though I hadn't heard of it. It also has a beautiful cover; OK--I'm shallow; I admit it. In her author's note, Tessa Holthe explains her family's history during WWII. Her father, the same age as the protagonist of the book--thirteen--was captured by the Japanese near Luzon, and tortured. Her maternal grandfather served in the U.S .Navy, and was on the U.S. Blackhawk when it was sunk at the Battle of Midway. Except the U.S. Blackhawk wasn't sunk at Midway. Not that I knew the ship casualty list for the Midway; I was reading the author's note aloud to my husband (a Navy guy and a WWII history buff) and he immediately informed me that there was no way her grandfather could have been drifting on a piece of debris from that mine tender as that particular ship hadn't been sunk. Indeed, she doesn't even have the name of the ship exactly right--it is actually U.S. Black Hawk. Did the author's grandfather serve on another vessel, or embellish his service, or what? So I hate to be a nit-picker, but getting granddad's ship wrong seems to me to be a major slip-up. It doesn't fill me with the greatest confidence on her zeal for historical accuracy. I even thought of stopping right on that page, and just reading "Noli Me Tangere." I'm going to give Holthe another chance, but she's on borrowed time. Tick, tick, tick. José Rizal, the author of "Noli Me Tangere", was born to a wealthy family in 1861 in Calamba, Laguna. He was of mixed Filipino, Spanish, Chinese and Japanese heritage. Despite his outstanding record as a language student and a writer, he was asked to leave one school due to his radical and bold questioning of the Dominican Friars. He gained a degree in medicine, specializing in opthamology, and then without his parents's consent, studied further in Madrid, Paris, and Heidelberg, where he earned a second doctorate. He also was quite successful with the ladies, and had an impressive international rosters of lovers. 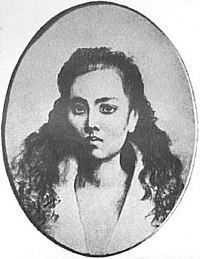 One of the many wome he courted was Leonor River, the inspiration for the Maria Clara, the heroine of "Noli Me Tangere." Her mother succeeded in finally breaking up the romance by withholding Rizal's letters to her daughter. Noli Me Tangere and The Filibusterismo (The Rebel) were actually written while Rizal was still studying in Europe. His depiction of the oppression of the Catholic Church, and the cruelties of the Spanish colonial system angered authorities. Upon his return to his homeland, he formed La Liga Filipina as a forum for non-violent reform. He was promptly imprisoned and then exiled to Minanao. Four years later, during another revolt by the Katipunan, another rebel group with which he had no connection. He was imprisoned again, and executed by firing squad. The anniversary of his execution is a national day of commemoration in the Philippines. I'll be reading the Spanish version of the novel with an occasional peek at the Charles Derbyshire translation which the Cervantes Institute of Manila must hold as the definitive English work as it is the version that they are choosing to use as their first-ever bi-lingual English/Spanish publication of the novel. Even if the original title Derbyshire chose was "The Social Cancer." Ugh. I'm feeling apprehensive about this novel as well. Can any novel bear up under the weight of such significance? We shall see.